The Convair F-106 Delta Dart is a single-engine single-seat all-weather interceptor jet fighter aircraft produced by the US-American manufacturer Convair, Consolidated Vultee Aircraft Corporation. The F-106 Delta Dart is a development of the Convair F-102 Delta Dagger, initially designated F-102B. 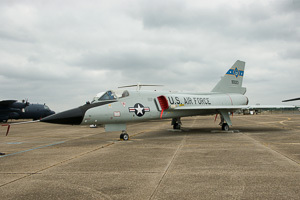 The F-106B is the two-seater trainer variant (63 built).